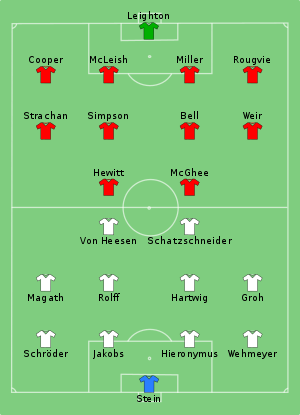 The 1983 UEFA Super Cup was a two-legged match contested between the European Cup champions Hamburger SV, and the European Cup Winners' Cup champions Aberdeen. The match was tied at 0–0 in the first leg at the Volksparkstadion in Hamburg. 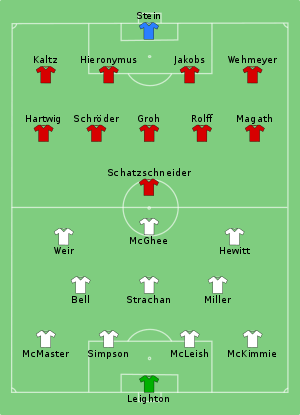 In the second leg at Pittodrie Stadium, Aberdeen added their second ever European trophy with a 2–0 victory over the Germans with goals coming from Mark McGhee and Neil Simpson. Aberdeen are the only Scottish team to win the UEFA Super Cup so far.